Two hundred twenty four people are confirmed dead after the Russian charter plane they are boarding crashed in Egypt’s mountainous area. 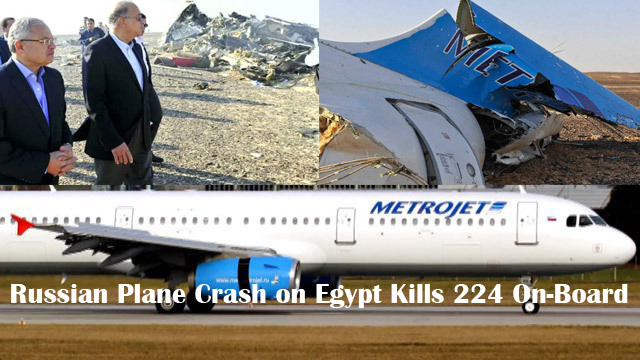 The number had been confirmed by the Egyptian security officials. The plane carrying 224 Russians and three Ukranians, with seven flight crews had took off from the Red Sea resort located in south Sinai en-route to Saint Petersburg, however, after 23 minutes, the plane lost contact with the air traffic control. According to the medical officials and the Egyptian security, there was no survivors and the debris and bodies were spread out over two square miles or five square kilometers. Even the Cairo’s Russian Embassy had released an official report stating that all of the passengers of Kogalymavia flight 9268 died in the crash and condolences are offered to the family and friends of those who had been demised. As of now, about 15 bodies had been recovered and taken to the morgue. The debri and wreckage is located around 60 miles south of North Sinai town of El-Arish. The official cause of the crash is still yet to be verified. Russian President Vladimir Putin is said to have ordered Moscow's emergency ministry to provide rescue teams in Egypt while the Prime Minister Ismail Sharif himself headed for the wreckage. The Russian emergency ministry had provided the list of names of the victims. The youngest victim is a ten month old baby girl.